Today a lot of companies address to outsourcing third party companies for assistance in order to cut expenses and focus on earning more money. Outsourcing companies provide remote virtual services for businesses to help them grow and increase incomes. Business owners have a chance to save time and money by delegating a part of work to remote staff, such as call and contact centers agents, virtual receptionists and other remote specialists who can take care of the most important things for their companies. Virtual staff assistance becomes very popular and it makes huge sense. IT Outsourcing services – recently, we launched a new department with professional developers, engineers and multilingual tech support (L1/L2). We offer a free consultation on our Request Consultation Form. Our goal is to minimize additional expenses and maximize customer satisfaction while you are focused on your business expanding. It’s not that easy task to save money and improve customer’s experience at the same time. Can you quickly develop the company, make it successful, stable, competitive and get on top? It takes time and a lot of efforts to reach the balance. That’s why hiring today remote staff becomes one of the best business solutions for successfully growing businesses. Our company provides a range of in-house call center services. It may become reliable outsourcing support for your business. It doesn’t really matter how long you’ve been building your own industry – 3 weeks or few years. We know exactly what is the way our team can help you on where you are now. Our professional staff gives you a helpful hand. You could already automate your sales and support services. But what about a part of customers prefer to call you directly? They still want to solve some issues or require an urgent answer. Customers love being in touch and communicate with businesses over the phone, email and social networks. These are common ways for your clients to contact you. It is instant and private. Try to mix your solutions in your B2C communications and offer your customers a multiple choice. As a result, it will definitely look more professionally. In this case you would probably prefer to create a call center or contact center to enhance customers experience. Therefore it is better for your business to hire virtual employees or get some help from an outsourcing company. They already have their virtual business support services and can customize it on your demand. A high rank manager has to be multitask-worker and needs some extra help too often in various activities starting from everyday planning and up to booking or mailing. Frankly speaking there is no need for the assistant to be nearby. Instant Internet access allows you to hire a remote personal assistant who will perform working duties on a constant or shift basis. Our company will help you to select the right person with a required number of skills according to your needs, so you won’t waste your time surfing through hundreds of CVs. Your personal assistant will have a phone line, chat or any other option of communication with you and will be ready to help exactly when it’s necessary. Bookkeeping is one of the key departments in any company. Accountants do number of things of crucial importance – pay bills and salaries, report to tax and other authorities, control supply and delivery, payrolls and time shifts, schedules and many others. In order to make their life easier and allow concentrate on main tasks hire remote bookkeepers. They will do every day routine things. If you run any services may need technical or any other type of support you’ll get a number of advantages of our help desk support agents who are available 24/7. You may start with a few advisers who will cover the most inconvenient shifts, and that will relieve you of paying higher rates and searching for a staff ready cover night shifts. Our remote team is providing 24-hour call center services while your business team builds a new strategy for your company. Whether you are looking for remote helpdesk support service or outsourcing online virtual support service, we are flexible everywhere! We will customize a solution in order to fit your specific requirements and provide you with needed remote virtual services and assistance. If you have a selling company, you can find our telemarketing operators for inbound or outbound calls extremely helpful. Our trained agents will do their best to receive all the calls. Try use both your own contact center and our remote call operators working on the cloud based platform. The development of IT and variety of communication services make the companies face new challenges to stay on top. A remote telecommunication manager will work with social media and networks, will constantly surf to be aware of all updates in local regulations or industry standards. Remote telecommunication manager services will help your company to achieve success in the targeted area. They monitor customer’ mood and expectations. You’ll be ready to provide your services regarding to all current and actual tendencies and customers’ expectations. One of the most obvious things you can delegate to outsourcing company is marketing research. You really do not need to keep this staff in your environment. Once you’ve assigned the tasks, the only thing you need is to check the execution process and regular reports. 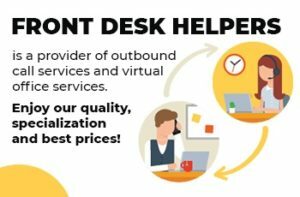 As the team of virtual researchers, Front Desk Helpers can perform those tasks quickly and professionally. Save your business time for prioritized actions and let your company’s development go ahead. Modern world tends to go away from paper works of everyday activities. Different applications, forms, inquiries, etc. can be easily done online. The Internet is a magnificent resource which is more convenient for work and keeping the information. Especially if you take into consideration different force major circumstances such as earthquakes, floods, fires, and human factor as well. That is why database administrators and data entry specialists from Front Desk Helpers may become a valuable asset of your company if you want to transfer the paper things into digital format. Life of an executive officers is rather hard and fast, they are trained to be multitask and take actions on circumstances in a timely manner. It’s not acceptable to waste working time for talking about things not really connected to their main responsibilities. What they really need is a professional team of receptionists working on several lines, transferring the calls to the appropriate department, or giving some general information, saving some extra time for the top managers. Nowadays outsourcing means differentiating business process into core ones and those may be easily performed by remote employees. Remote HR specialists can make appointments, schedule and working hours control, vocation and other questions. They perform a number of functions through the phone and Internet access to CRM or other business platforms. Almost every department in the company can delegate a big quantity of tasks to outsource companies. Therefore, to help your business grow we also offer a wide range of outsourcing support services. Our company can organize administrative support and executive assistance, phone answering and other sorts of remote virtual services for you. If your company runs a business that needs any kind of technical support we will be happy to suggest you specialists from Front Desk Helpers. We will help your customers to resolve any technical issue or problem with your products. Our employees can cover all 24/7 shifts without extra expense from your side. You pay just an hourly rate and we deal with everything. Our remote staff will be trained according to your company standards and will follow all your protocols. As the world turns into a global village, translation industry becomes a highly demanded service. But the question here is you don’t really need an interpreter be working full shift or you may need a translator of several languages, and it is really a hard task to find one who can cover all your needs. That is why it is easier to use a remote translation service exactly when you need and pay only for the time when a translator works. Modern technologies allow all the participants to join an Internet or telephone conversation physically being in the different parts of the world. We work with professionals not only in languages but they also specialize in different areas and we can find one who can fit your goals perfectly. Dispatching is a rather tiresome and boring thing, luckily you can pass this job to a remote dispatch operator who can organize this time and effort consuming task with the maximum efficiency. A remote dispatch operator will help with assigning cars for goods delivery or plumbing, locksmith or taxi. They may help you in dealing with brokers or in coordinating your loads. In any case, it’s a good idea to use remote dispatching operators to save you time and money. Most companies nowadays sooner or later may need a call center for the customer or technical support. As far as your company is a small one, and the volume of calls is not large to prevent the staff to perform their core duties. While the business grows you’ll face with the need either to organize the call center within your company or to pass this task to the professionals and get hosted solutions for a call center. and it means that you don’t have to bother about equipment, office space or employees. You receive a ready-to-go solution based on your needs and wishes. Using a VoIP call center, you don’t need to look for an office for our team. That means we can provide your company with high quality outsourced customer care from our own office. Our professionals are able to allow the business to open up simply by providing quality service in the right direction. At the time, you will be able to reach new levels of your business. First of all, our company’s goal is to help your business grow by using our knowledge and experience with other companies. Secondly, we want to grow professionally by our selves. That means every company or every single customer that uses one of our services or maybe some range of them is an integral participant in the formation of our professionalism. We work to save you time and money!